224 pages | 35 B/W Illus. Out-migration might decrease the pressure of population on the environment, but what happens to the communities that manage the local environment when they are weakened by the absence of their members? In an era where community-based natural resource management has emerged as a key hope for sustainable development, this is a crucial question. Building on over a decade of empirical work conducted in Oaxaca, Mexico, Communities Surviving Migration identifies how out-migration can impact rural communities in strongholds of biocultural diversity. 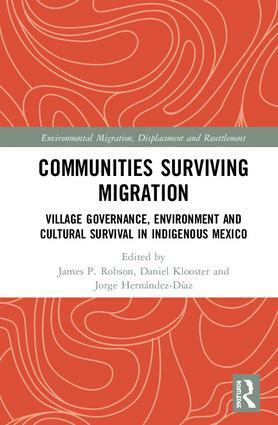 It reflects on the possibilities of community self-governance and survival in the likely future of limited additional migration and steady – but low – rural populations, and what different scenarios imply for environmental governance and biodiversity conservation. In this way, the book adds a critical cultural component to the understanding of migration-environment linkages, specifically with respect to environmental change in migrant-sending regions. Responding to the call for more detailed analyses and reporting on migration and environmental change, especially in contexts where rural communities, livelihoods and biodiversity are interconnected, this volume will be of interest to students and scholars of environmental migration, development studies, population geography, and Latin American studies. James P. Robson is Assistant Professor (Human Dimensions of Sustainability) at the University of Saskatchewan, Canada. Dan Klooster is Professor of Environmental Studies at the University of Redlands, USA. Jorge Hernández-Díaz is Research Professor at the Universidad Autónoma Benito Juárez de Oaxaca (UABJO), Mexico.